Waterless No-Flush™ urinals resemble conventional fixtures, and easily replace them. They install to the regular urinal 2” waste line (for 1.5” waste lines, use a reducer bushing). They eliminate flush water supply lines. Flush valves are completely eliminated as well. No handles to touch, no sensors to install or adjust, no moving parts at all! The urinal bowl surfaces are smooth and urine repellent; urine is 95% liquid and its drainage is effected without flush water through gravity. Daily cleaning procedures are the same as for flushed urinals, yet save time per urinal. The conventional water-filled urinal trap is replaced by a disposable EcoTrap® inserted in the urinal drain outlet of our urinals. It holds a layer of the proprietary immiscible BlueSeal® liquid, floating on top of a urine layer. The combination of our EcoTrap® and the covering BlueSeal® blocks out sewer gases and urine odors from the restroom. A 3 ounce dose of BlueSeal® lasts up to 1500 uses, replacing from 1000 and up to 4500 gallons of quality potable flush water at each fill! All wall drain No-Flush™ urinal models install like flushed urinals to the drain line via a gasket and flange. No adaptors needed! All of our urinals have a full 2” interior drain line. This allows easy line cleaning and access if needed. Urinal does not need to be removed from wall for snaking. Saves time! No gaskets or O-rings needed on EcoTrap® inserts. Simple press fit! EcoTrap® removes completely for servicing and change-out. No taking traps apart for cleaning and to reassemble! 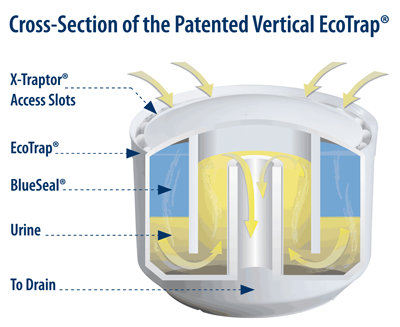 The patented EcoTrap® relies on the proven and simple vertical trap principle. 1. Urine flows down into the EcoTrap® drain insert. 2. In the EcoTrap® the urine passes through a floating layer of BlueSeal® liquid, which forms a barrier that prevents sewer vapors from escaping to the restroom atmosphere. 3. Urine under the barrier layer overflows into the central tube and runs down to the conventional drain line. 4. The layer of approx. 3 ounces of BlueSeal® will last for about 1500 sanitary uses. The liquid is then simply replenished. Task time: 20 seconds. Trap does not need to be touched. 5. The EcoTrap® retains urine sediments and is easily replaced 2-4 times a year according to traffic to the fixture. A special tool, the X-Traptor®, is used to remove the EcoTrap®. This deters vandalism. Task time: 3-4 minutes. The patented vertical EcoTrap® design provides superior efficiencies to other, more complicated trap arrangements. It does not need to be cleaned out as it is simply changed out. It also helps retain urine sediments. Urinals without trap inserts may clog the urinal’s internal trapway.